Not much has changed in terms of fishing…..except for the weather. We’ve had one extreme to the other and I’ve been using my rain gear and sunglasses all in one trip some days. 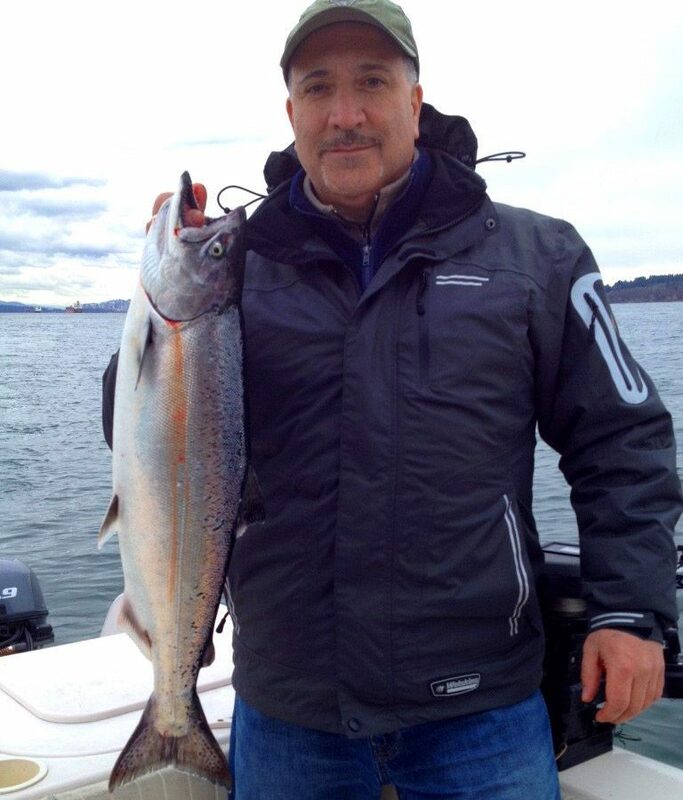 Over the last week there was some pretty good fishing in some spots up Howe Sound and slow in other areas on any given day. The harbour has also been producing very well but again there have been good days and slow days. That said, on some of the slow days we’ve come back with stories of the big ones that got away! I wish I could have taken photos of some that almost made it to the net for the report. It’s funny in that just as I writing this I got a phone call from a fellow guide fishing on his day off who lost a very good fish. Just goes to show that even an experienced angler can have a hard time getting these hard fighting winter chinooks to the boat. Overall this year has been one of the better winter chinooks seasons I can remember. I’m sure its due in part to the consistent abundance of bait signals I keep seeing on the depth sounder. In terms of gear the spoons and flashers we have been talking about in reports the last few weeks continue to produce for us. Sadly the gear in the photo of last weeks report with the fish in the net was lost when a very strong gust of wind caused me to snag it on the bottom. It was a special spoon/flasher combo that was very successful for me on the water but as it was a prototype size variant of the new Pesca “Pacific Angler” I was test fishing I will have to wait until more are made! Fortunately whenever you loose good gear you usually find another if you keep trying different spoon and flasher combos. Lately spoons like Silver Hoard Irish Cream, Gibbs Green Glo, Army Truck and Pesca Uncle Bob and Pacific Angler in 3.5″ to 4″ matched up with Chartreuse Double Glo, Green Onion and Salty Dawg flashers have been some my favorites. Hoochies are also starting to come online with Spackle back, White, Glo, Blood n Bones and Army Truck being excellent choices. Typically keeping the gear close to the bottom is the way to fish for Winter Chinooks but I am starting to get hits further up to about the first 1/3 from the bottom of the water depth. Prawning has been “spotty” (pardon the pun) but crabbing has been pretty good. I’ll be on the water as this report goes out and we have back-to-back trips coming up so I’ll be able to gather more intel. Good Luck and I hope our reports help bring you success out on the water!